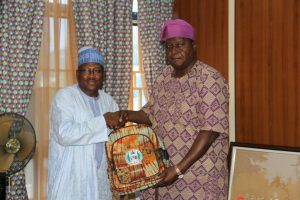 L-R: OTUNBA OLUSEGUN RUNSEWE, DIRECTOR-GENERAL, NATIONAL COUNCIL FOR ARTS AND CULTURE PRESENTING A LOCALLY MADE IPAD BAG TO ALHAJI RABO SALEH KAREEM, PRESIDENT FEDERATION OF TOURISM ASSOCIATION OF NIGERIA WHILE ON COURTESY CALL TO THE CULTURE HEADQUARTERS, RECENTLY. 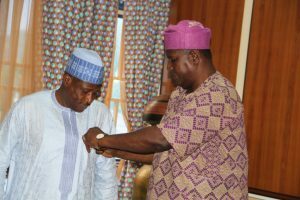 L-R: OTUNBA OLUSEGUN RUNSEWE, DIRECTOR-GENERAL, NATIONAL COUNCIL FOR ARTS AND CULTURE DECORATING ALHAJI RABO SALEH KAREEM, PRESIDENT FEDERATION OF TOURISM ASSOCIATION OF NIGERIA WHO WAS ON COURTESY CALL TO THE CULTURE HEADQUARTERS, RECENTLY. 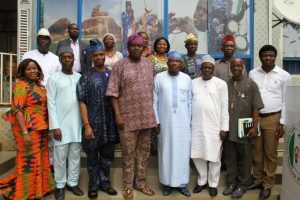 NCAC MANAGEMENT AND FTAN EXCO IN A GROUP PHOTOGRAPH DURING THE COURTESY CALL.